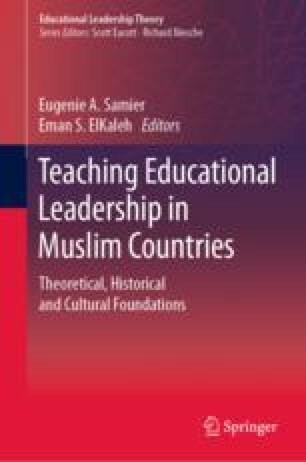 This chapter seeks to expose the challenges and promises faced by educational leadership and management (EDLM) scholars in Arab societies as they strive to establish an indigenous knowledge base that is connected to the global international scholarly discourse. We examine this issue and consider its implications for leadership development in the Arab context. Given the relative scarcity of Arab-related EDLM literature published internationally, our intention is to engage our international colleagues in the dialogue, hence responding to the multiple calls of international scholars to expand the cultural bases of the existing knowledge base in the field. In this chapter, we embrace a broad conception of leadership preparation that goes beyond initial preparation to encompass induction programmes and in-service training. The chapter engages with current international trends in educational leadership development and proposes future directions for research and practice in the Arab region. Special thanks to Nadia El Saheb for her assistance during the researching and writing of this chapter. Al-Dabbagh, M., & Assaad, C. (2010). Taking stock and looking forward: Leadership development in the Arab world. Dubai School of Government Working Paper. http://wagner.nyu.edu/files/leadership/LeadershipDevelopmentProgramsArabWorld. Accessed June 20, 2018.